Thanks to Alan who sent these pictures in, showing a grey Ford Thames 400E from his own collection. 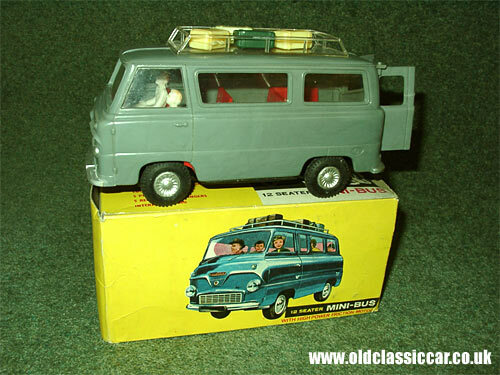 "This is one of probably hundreds if not thousands of Hong Kong plastic 'toys' of the fifties/sixties. 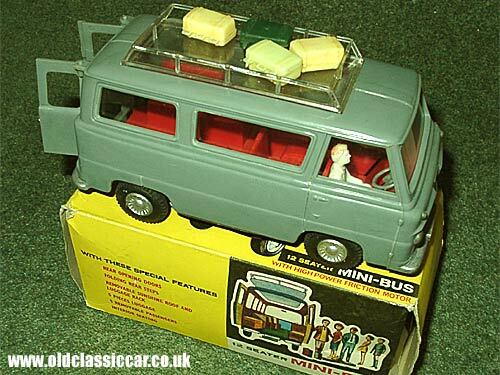 It is of a Ford Thames Minibus. To me possibly a Martin Walter conversion or maybe someone knows better! This one is in a very uninspiring mid grey with red interior. The back doors open and there was originally some steps. Complete with driver, some passengers and luggage, the model is about 6 inches long and powered by a friction type of motor." Great, thanks for the information! The 400E range of vans, estate cars and pickups, first saw light of day in 1957, replacing the popular, but long-in-the-tooth, E83W range of light commercials. The fully forward control layout of the 400E offered the best use of overall body space, and was light years ahead of its pre-war based predecessor, yet was replaced just a few years later by the first of the Ford Transit models, which went on to be one of the most popular vans of all time.